The goal is to accelerate the trail building process, bolstering IMBA vision of everyone across the country having access to great trails. The International Mountain Bicycling Association (IMBA) has awarded its first round of IMBA Trail Accelerator grants to three recipients. The IMBA Trail Accelerator grant fund is a competitive grant offering for communities with visions for model trail systems that need extra support to realize that vision of more trails close to home. Awardees provide matching funds and receive professional trail planning and consultation services from IMBA Trail Solutions to launch trail development efforts, which can often help leverage more interest and investment for community trail projects. All three IMBA Trail Accelerator projects have the potential to transform nearby communities through trails, leading to increased local access and offering health benefits to residents, while having opportunities to expand into larger, destination-worthy trail systems. Mountain Creek Park in Hixon, Tennessee — Mountain Creek Park will provide the first downhill trails in the Chattanooga region, offering new opportunities for local and regional riders. It will also become the first local recreation area to offer both mountain biking and climbing. The project is a collaboration among six recreation and conservation groups including SORBA-Chattanooga, the local mountain bike organization, that aims to increase access to the outdoors for the nearby Red Bank school system and surrounding low- and middle-income communities. The North Chickamauga Creek Conservancy has received $12,500 for an initial 10-mile trail plan. De Queen Lake Trails in De Queen, Arkansas — De Queen Lake has 32 miles of shoreline, more than 100 campsites, 8700 acres of surrounding land and the vision to become a mountain bike destination. The community will soon have its first three-mile trail at the lake, and wants to follow that with a plan for more. The organizations involved, including the Army Corps of Engineers, see the trails as a way to address the region’s obesity challenge, as well as a venue to welcome De Queen’s minority population to mountain biking. Legacy Initiatives has received $18,000 for a community-wide assessment. 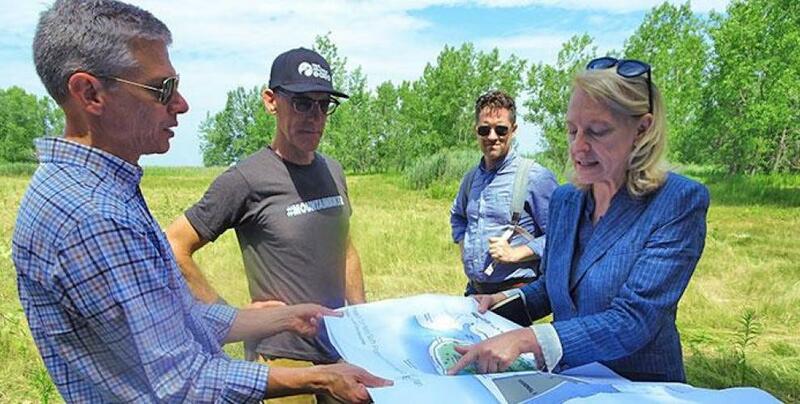 Grandma’s Gateway in La Crosse, Wisconsin — This project will turn an iconic regional landscape with no formal trail access into a community trail system, ripe with opportunities to connect to several nearby public lands. Developing Grandad Bluff Park into a multi-use trail system will provide neighborhood access, alleviate pedestrian road traffic and help clear out litter and invasive species. The closest school to new trailheads is a quarter-mile away. Outdoor Recreation Alliance of the 7 Rivers Region has received $15,000 for a trail concept plan. Trail plans for all three IMBA Trail Accelerator recipients are scheduled to be completed late fall. IMBA also issued thanks to the Walton Family Foundation for underwriting the program and REI for its support. Look for dates on the next application period for Trail Accelerator grants later this fall. Learn more about criteria and eligibility for the grants on the grant webpage. The International Mountain Bicycling Association is a 501(c)3 nonprofit educational association established in 1988. Its mission is to create, enhance and protect great places to ride mountain bikes. Learn more at imba.com.